About Us | Sholom - Care. Compassion. Community. For more information, please call or email us using the information below. Three entities comprise the Sholom Family. Gifts in honor of someone's special occasion or to remember a loved one can be made to either the Sholom Foundation General Fund or to a specific fund. Your gift will be acknowledged along with a personal message to whomever you wish notified. All donations will appear in the Circle of Life and will be acknowledged on a regular basis to the donor in a letter suitable for tax purposes. To view a list of Sholom Foundation Funds, click here. Mail a check to the Sholom Foundation, 3610 Phillips Parkway, St. Louis Park, MN 55426-3700 along with your personal message and address of the recipient to whom you wish the gift acknowledged. I'd like to help, but will my small donation really make a difference? The Sholom Foundation welcomes all gifts, regardless of size. Every gift brings us that much closer to our long-term goal of a $100 million endowment that will support the Sholom Community Alliance facilities and programs long into the future. An endowment fund is a gift that lasts in perpetuity while the income is used for a specific purpose or, if undesignated, allocated for use by the Sholom Foundation Board of Directors to provide service Sholom clients and residents..
Why do some of the Sholom Foundation funds list a specific purpose? Donors may request their contribution be used for a special use. Funds that provide therapeutic recreation, musical entertainment for residents at the Sholom nursing homes, and other Sholom facilities, religious activities, staff training, scholarship assistance, and employee appreciation are examples of some of the designated funds. 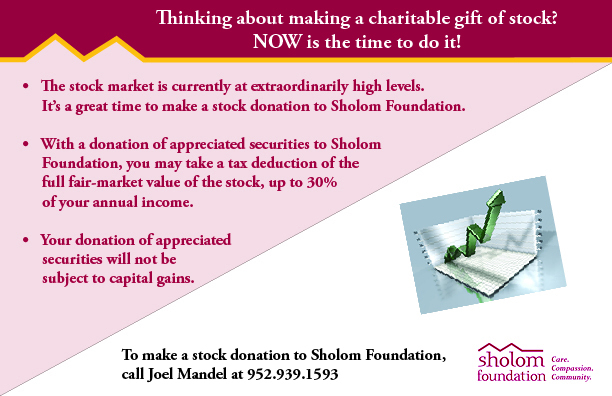 To view a list of Sholom Foundation Funds, click here. How do I contribute to an existing fund in someone's honor? Gifts in honor of someone's special occasion or to remember a loved one can be made to either the Sholom Foundation General Fund or to a specific fund. A donation card, along with your personal message, will be mailed to the recipient. All donors will be acknowledged in the Circle of Life. Gifts will be acknowledged to the donor in a letter suitable for tax purposes on a regular basis. Click on the "Donate Now" wherever it appears on this website to make an online donation. Use the donation envelope found in the Circle of Life newsletter.